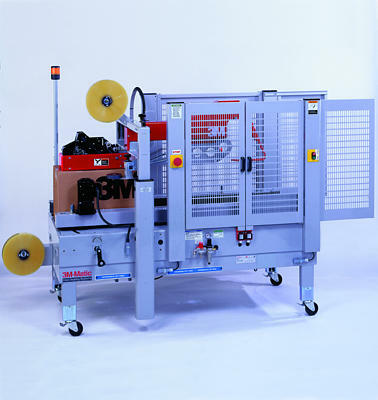 Automatically folds top minor and major flaps and tightly seals cases at up to 28 cases/min. Spring-loaded drive with twin gear motors for heavy-duty performance. Includes 3M AccuGlide II Taping Heads for low-impact application of tapes 48 mm to 72 mm wide. Choice of case sealers to automatically fold top major and minor flaps and tightly seal cases. Sealing rate of up to 28 cases/minute. Adjusts manually to a wide variety of case sizes.